The Dog Days of August are now here and the sweltering heat and humidity are upon us. In fact, it is so hot that we are even offering a RED HOT SAVINGS to you! 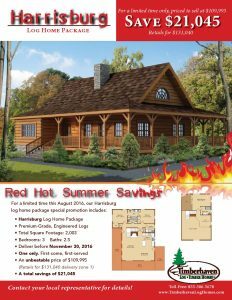 We have substantially reduced the price on one of our Harrisburg models and it is available this month on a first-come, first-served basis. So, do not delay. If you are in the market for a log home and want to save BIG $$$$, now is the time to call Morningdale Log Homes at 814-967-2206 and talk to us about making your log home dream become your Dream log Home!